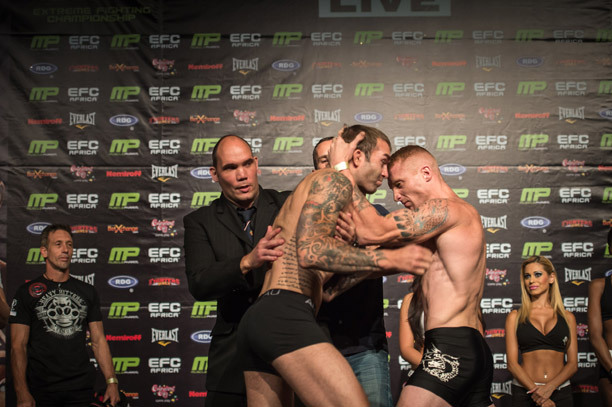 Johannesburg (South Africa) – An electric atmosphere and a hyped audience filled the Mardi Gras Theatre at Carnival City on 22 November for the official EFC AFRICA 17 weigh-in. Judging by the intense face-offs, tomorrow night’s action will be explosive. Wade Henderson and JP Kruger exchanged lethal stares and showed absolutely no love for one another, and promised fans a fiery battle. Lance Ceronio was 2.1 kg overweight and will be financially penalised. Ceronio will also have to meet certain weigh standards before tomorrow at 16:00.